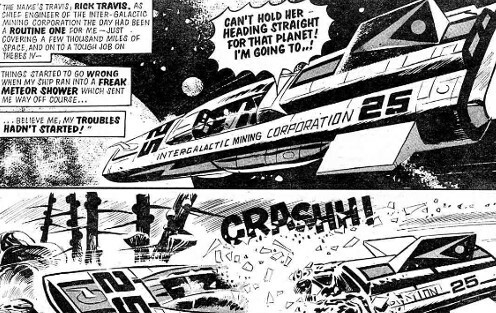 As a kid, I used to read a comic book called 2000 AD, and I'm reading a bunch of them all over again. I no longer have my own back issues, but I found some scans that I've downloaded and I'm reading on my phone. I write a lot about 2000 AD, it was a very formative experience for me, and I still read it today. I have a 2000 AD page where I link to all the issues I have talked about on this site. 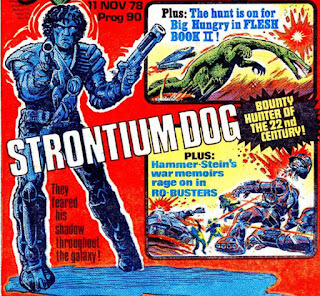 I've reached issue 90 in my journey through back-issue scans of 2000 AD and I'm devouring these comics right now, like binge watching TV. 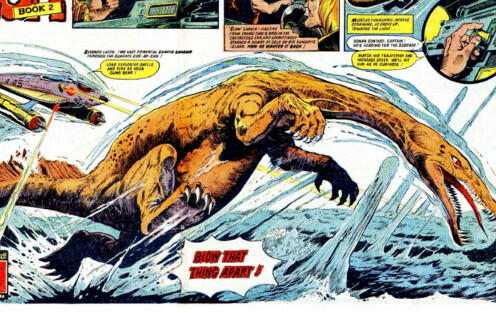 I'm thoroughly enjoying three or four of the old comics per day. It somehow feels amazing to me now that I had to wait a whole week between each issue back in 1978. This issue of 2000 AD came out 11 November 1978, when the nights were getting long and the mornings and evenings were dark. Comic books and TV shows were little patches of light within the gloom for me, helping me navigate through the dark days until Christmas. There were dark forces out in the wider society, too. Back then, in the November 1978 United States midterm elections, the Democrats lost fifteen seats in the House of Representatives and three seats in the Senate. This election set the stage for the Reagan Revolution, the beginning of dark days indeed. Many of the newly elected members of Congress were also more conservative than their predecessors, and this was the last period in which the Democrats had control of both the White House and Congress for more than two years at once. While the USA was just starting to lurch to the right, the 28th Miss World pageant was held on 16 November 1978 at the Royal Albert Hall in London. The winner was Silvana Suarez from Argentina, crowned by Miss World 1977, Mary Stavin of Sweden. People knew this competition was sexist, it was disrupted by protesters in 1970, but it was still going strong in 1978. In fact these competitions, beloved of Trump, are still happening now. Nowhere is the gendered double standard more apparent than in the Miss Universe competition. While women in all industries face professional hurdles, pageants are one of the only workplaces where they are required to wear ball gowns while doing so. In this annual competition, women are expected to be gorgeous, intelligent, and poised; to look good in a bikini, ace a question-and-answer segment, represent their entire nation, and walk perfectly in high heels. At the time, I had no interest in either of these events. 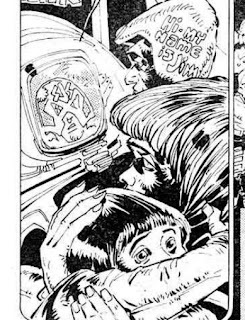 I was in a world of my imagination, away from the darkness, reading my favorite comic book; 2000 AD. This week's cover is a bad cut and paste job, probably the worst cover I have seen so far, though I am sure there will be other substandard covers to come as I read through these old issues. It isn't so much a cover as a sketch of an advert for the comic with daubs of color on it. 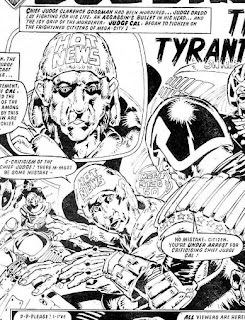 The first story up is Judge Dredd, illustrated by Mike McMahon, whose art I have rhapsodized about at length in these posts before. This story arc, called The Day the Law Died, isn't just a classic for the art though, it is also interesting reading it again in the days of Trump. 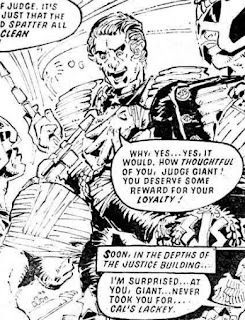 On page one of this episode we see the new chief judge, the equivalent of the president in the future world of Judge Dredd, closing down media news outlets, making me think of Trump. McMahon's illustration of the newscaster is beautifully shaded. It is a very idiosyncratic style that not everyone loves, but I'm a fan. There is a picture of an SJS Judge, a not particularly subtle reference to the Waffen-SS, arresting viewers through the camera that perfectly captures the craziness of a government at war with its own citizens, again, like that of Trump. With his bad hair and his apocalyptic rhetoric, Chief Judge Cal is Trump. 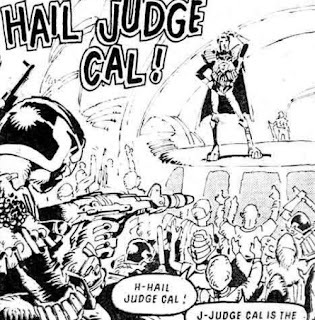 I think Trump might even enjoy wearing the futuristic outfit that the Chief Judge wears. Cal is so much like Trump throughout this story that I almost want to talk about every panel in this strip. There is so much going on this one panel alone, including the militarized police, the public being forced to cheer, the preening tyrant (here with a 70s Galm-Rock, pop-star aesthetic), while we see a Judge wielding a night stuck in the bottom corner. Ro-Busters is next, and we have another of the amazing talents that were working on 2000 AD back in 1978, Kevin O'Neil. 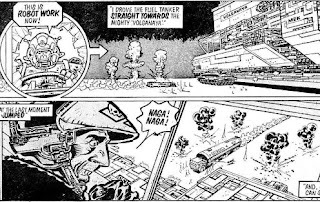 Again this week, the strip is given over to the war stories of a clapped-out, army-surplus war droid, and O'Neil exaggerates the technology to such a degree it becomes part of a landscape that people caught up in it must try to survive. He draws a warscape, with mountainous war machines crawling across a devastated landscape. The entire series is available to buy from Amazon. One whole page is given over to showing one of these rumbling mountains of technology. 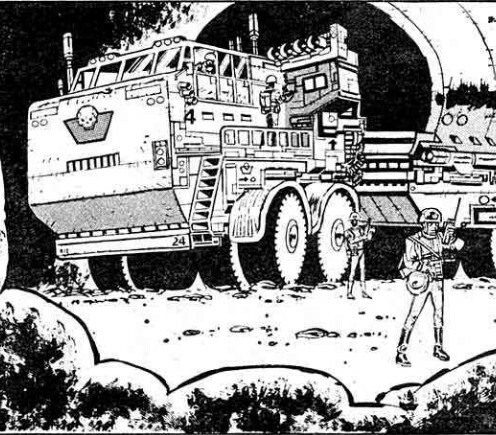 Hammerstein, the old war robot whose memories these are, calls it a Behemoth-class Tank Fortress, and it is truly an impressive work of draftsmanship on the part of O'Neil. The actual writing in the story is full of dumb war tropes, like the crazy soldier who is considered to be faking it. This is the classic Catch 22, a term coined by Joseph Heller, who used it in his 1961 novel of the same name. But, as I said, the story might be a cavalcade of dumb, macho tropes but the art is astounding. The super-huge tank needs a super-big fuel tanker, and we get it lovingly drawn by O'Neil, with the skull logo of the bad guys on its nose. The sense of scale O'Neil creates as Hammerstein drives the huge fuel truck at the fortress tank is impressive. We know the oil tanker is a monster, but it looks like a tiny thing in comparison to the fortress, especially when seen from the point of view of the driver of this mountainous machine. This is an outstanding issue already, after just two stories, and these are followed by another very fun read. The third story is Flesh, which is its usual bloodthirsty and fun self. 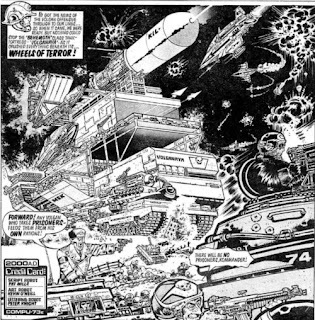 The premise of the story is that time-travelers are fishing the seas of prehistory on an industrial scale to feed the overpopulated future, and the strip is as crazy as that sounds. In this episode, a team of these time travelers are outsmarted by a dinosaur. The walnut-brained creature tricks them into smashing their submarine into some rocks. 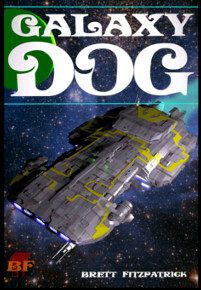 It's a story that is a lot of fun to read, though not exactly hard sci fi. 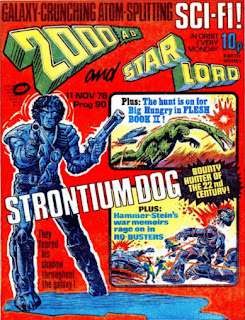 We also get a short story this issue, with art by Pino, who did most of the Ro-Busters strips, back when it was still in Starlord. He's no O'Neil, but his art is stylish and sparse. The story itself, unfortunately, is complete baloney, with a spaceman crash-landing on a planet of people who age like Benjamin Button. It's stupid, and it's one of the reasons I'm not such a fan of sci-fi short stories sometimes. There is such an imperative to have a twist ending. 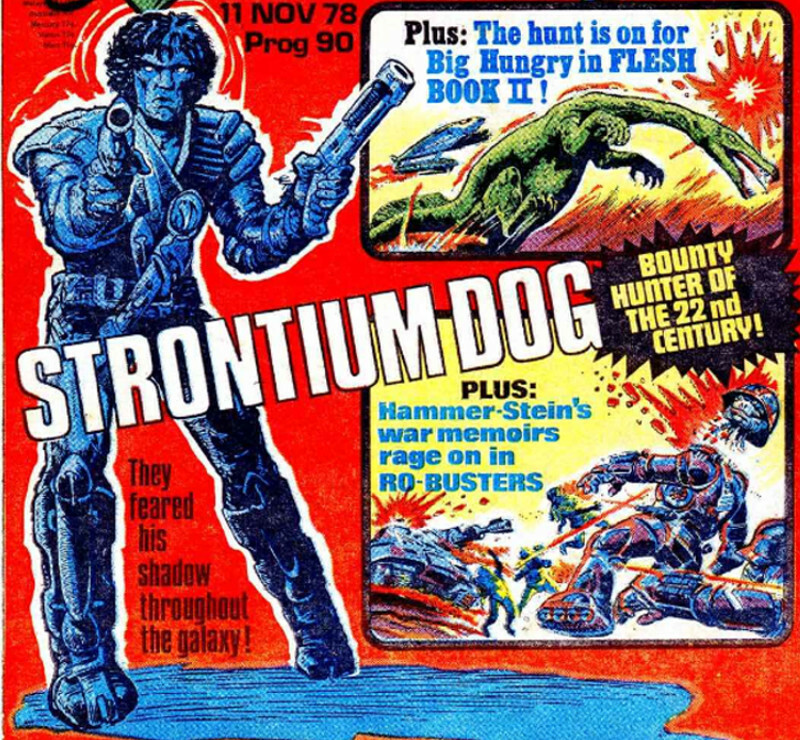 As if all this good stuff isn't enough, there is also a Strontium Dog story, too. It's another war story, but this time our heroes are being forced to fight, so they aren't quite as gung-ho as the characters in Ro-Busters. Issue 90 is a very interesting comic book, from a very interesting time, and I thoroughly enjoyed reading it again, all these years later. It may be crazy and macho, with no hope of passing the Bechdel Test, but it still has things to say about the world we live in today, and the art is done by old masters of the craft of comic book drawing.